Though he wasn’t the most talented instrumentalist, nor the most able vocalist, the popular blues musician Peetie Wheatstraw—the Devil’s Son-in-Law, the High Sheriff from Hell—achieved great success in his time, and made a considerable impact on fellow musicians for years to come. Contrary to the events presented in the 1977 film Petey Wheatstraw, Peetie Wheatstraw was not born as a walking, talking child. Rather, he was born as William Bunch on December 21, 1902, likely in Ripley, Tennessee or Cotton Plant, Arkansas. He learned to play the piano and guitar and in 1929 took up residence in East St. Louis, assuming the moniker “Peetie Wheatstraw, the Devil’s Son-in-Law”. Some have suggested the “Peetie Wheatstraw” name traces its roots back to early Afro-American folklore, yet others suggest that Bunch himself was the originator. Brought to the studio by bluesman and talent scout Charley Jordan, Wheatstraw made his first record for Vocalion in 1930—”Tennessee Peaches Blues”, assisted by an unidentified fellow by the name of “Neckbones” (possibly J.D. “Jelly Jaw” Short)—and he continued to record for them until 1936, with a handful of recordings made for Victor in 1931 on the side. While still featured on Vocalion, Wheatstraw began recording for Decca in 1934, soon switching to that label exclusively. Peetie Wheatstraw died in a car accident on his thirty-ninth birthday—he was sitting in the back seat of a Buick driven by a friend, when it struck a standing freight train, killing all passengers—less than one full month after recorded the prophetic seeming “Bring Me Flowers While I’m Living”. With an idiosyncratic and formulaic style of singing and playing piano, Peetie Wheatstraw maintained a position as one of the top-selling and most prolific blues artists throughout the decade of the 1930s, alongside Blind Boy Fuller, Big Bill, and Bumble Bee Slim. Influences of Wheatstraw’s signature piano style, mumbled vocals, and “hoo-well-well” holler could be heard in the music of many less successful blues artists across the land, such as Alabama’s Peanut, the Kidnapper (whose stage name is one of the few to rival “Peetie Wheatstraw”). A testament to his success, fellow blues musician Robert Nighthawk was billed by Decca for a time as “Peetie’s Boy”. Even noted Texas bluesman Andrew “Smokey” Hogg started out veritably copying Wheatstraw’s vocals and guitar playing, and was known as “Little Peetie Wheatstraw”. Decca 7815 was recorded on April 4, 1940 and August 28, 1940 in New York City. Peetie Wheatstraw is accompanied by Jonah Jones on trumpet, possibly Lil Armstrong on piano, and Sid Catlett on drums. First up, Peetie Wheatstraw sings one of his more famous recordings, the swing infused “Gangster’s Blues”. The noted accompanists account for the reason why these two songs don’t sound just like most every other song Wheatstraw recorded. 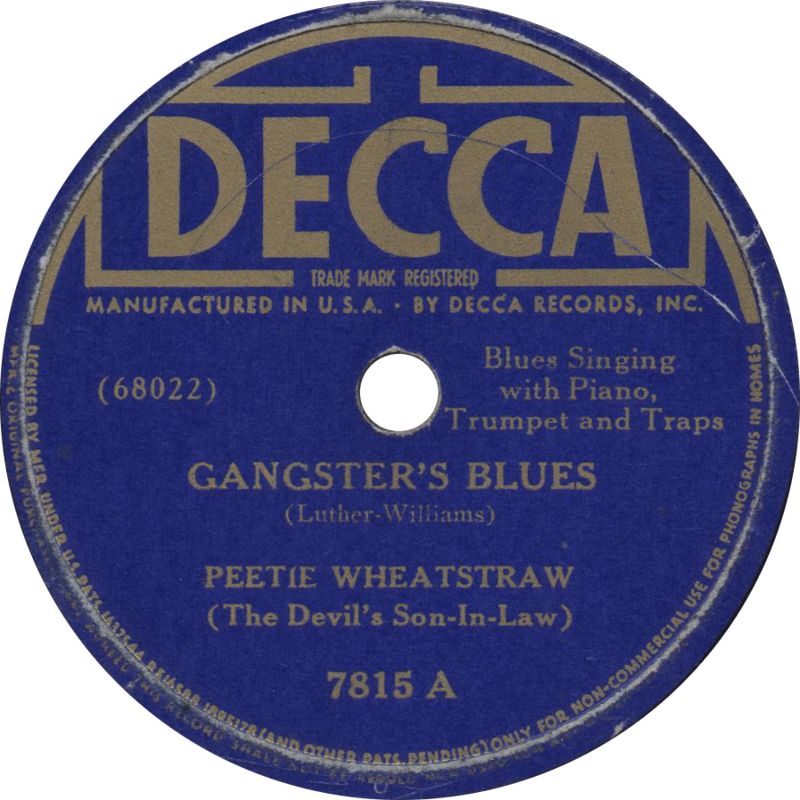 Gangster’s Blues, recorded April 4, 1940 by Peetie Wheatstraw (The Devil’s Son-in-Law). Next, Wheatstraw sings “Look Out for Yourself”, one of countless blues songs echoing the melody of “Sitting On Top of the World”. Look Out for Yourself, recorded August 28, 1940 by Peetie Wheatstraw (The Devil’s Son-in-Law). You bought my wife a Coca-Cola so you could play on her Victrola.